We decided to drive from Launceston to Green’s Beach, taking in some of the local tourist attractions along the way. Several people had told us that we just had to take the kids to see the echidnas at Platypus House located on Inspection Head Wharf in Flinders Street at Beauty Point. We joined a tour and saw the platypus. I did not manage to get any photos of the platypus. 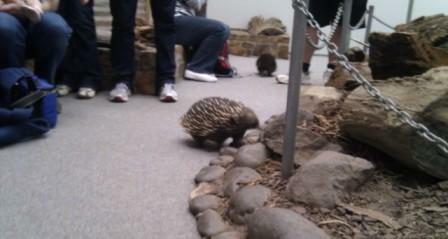 We then entered the Echidna Garden. 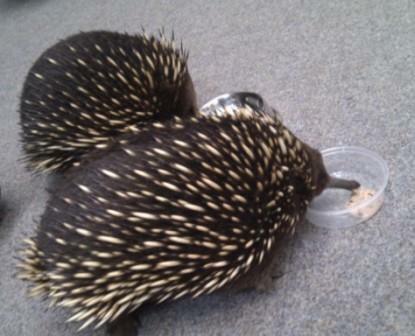 We were all asked to sit down or stand still — and then the echidnas were released. They scurried around our feet quite unconcerned about the visitors. Our family was delighted at being so close to such an odd animal! After finishing the Platypus House tour, we then walked down Inspection Head Wharf to Seahorse World. Seahorse World gives visitors a unique educational tour experience through a fascinating aquarium dedicated to the breeding, education and conservation of the seahorse. The facility started as a research facility initiated at the University of Tasmania. It then began commercial breeding, supplying both marine and freshwater fish to pet wholesalers and public aquariums around the world. 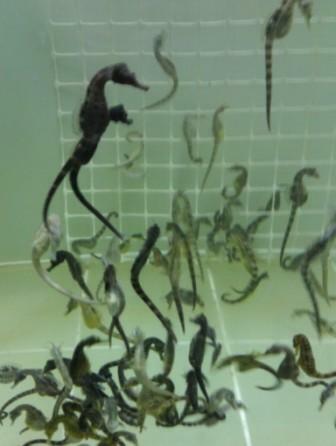 Apparently visitor interest was such that Seahorse World opened its doors to the public, providing a unique tourism experience. My family certainly enjoyed visiting Seahorse World and seeing the aquarium tanks full of these amazing creatures. We drove up the western side of the Tamar River to get to Greens Beach. 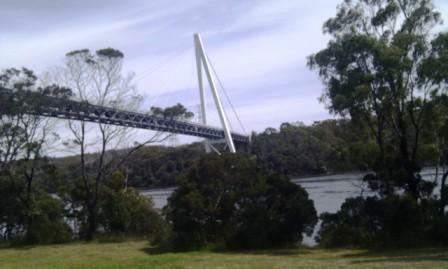 Returning, we crossed the Batman Bridge to drive back along the Tamar River on the eastern side back to Launceston. The Batman Bridge was named after John Batman, one of the founders of Melbourne, who earlier lived in northern Tasmania. Open in 1968, the 432 metre bridge is notable because it was one of the world’s first cable-stayed truss bridges. It is dominated by the 100 metre high steel A-frame tower. The weight of the 206 metre main span over the river is almost entirely carried by the tower.